Dr. Burton is dedicated to enhancing the professional veterinary student experience by using innovative technology teaching tools to enhance student participation, feedback, and assessments. She utilizes a case based approach to teaching to create a foundation of lifelong learning and problem solving skills in early didactic training. 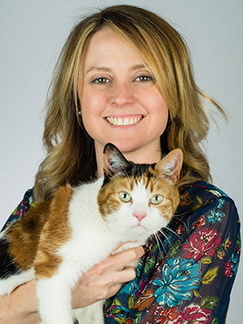 Aside from teaching, Dr. Burton's professional interests include hemoparasites (specifically Cytauxzoon felis), cytology, hematology, small animal microbiome (urinary and GI), and point of care diagnostics. My research is focused on providing collaborative support in the fields of clinical pathology, cytology, canine microbiome, and companion animal hemoparasitic disease. My other research interests include technology tools that enhance the professional learning environment as well as provide state of the art feedback and assessment. I am interested in integrating active learning techniques and new state of the art technologies into my classroom. I am dedicated to providing diagnostic services in the areas of clinical pathology and parasitology for the University of Minnesota College of Veterinary Medicine and the community.